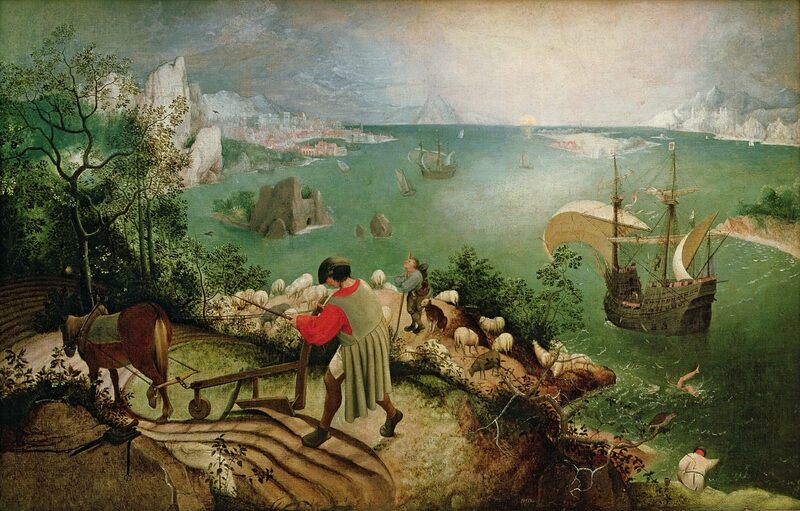 "Landscape with the Fall of Icarus," painted around 1555. I was in Vienna at the end of October, to see the once-in-a-lifetime Bruegel exhibition (on view through Jan. 13) at the Kunsthistorisches Museum, which owns the world’s largest collection of Bruegels — 12 of his surviving 40 paintings. That one room with all 12 paintings has been one of the supreme locations for great art. Now this show, celebrating the 450th anniversary of the master’s death, has brought together for the very first time practically every Bruegel painting not too fragile to travel, plus his even rarer drawings and a selection of contemporary prints based on original Bruegel drawings mostly lost. On one wall, four of his five currently surviving paintings of the seasons, including the beloved "Hunters in the Snow," were reunited for the first time since they were painted (the Metropolitan Museum wouldn’t allow the fifth, the famous "Harvesters," out of its sight, let alone cross the ocean). It was an overwhelming display. Bruegel, who died about four years after Shakespeare was born, seems to me perhaps the most Shakespearean of painters — partly because his sense of humanity encompasses such a broad emotional spectrum: from comedy to satire and bitter tragedy (the "seasons" paintings alone range from the flirtatious young girls of "Haymaking" to the autumnal melancholy of "The Return of the Herd" to the wintry catastrophe of "Dark Day"). He gives us both the cruelty and the beauty of nature. His magical "Adoration of the Magi" may well be the very first European painting to show snowflakes falling. And his paintings offer the Shakespearean alternation between intimate detail and epic scope. There’s the poignant "Two Monkeys," the Falstaffian "Peasant Dance," and the cast-of-thousands "Christ Carrying the Cross" (which is displayed in this exhibit without its frame, so that we could see the thinness of the wood panel it was painted on and how amazing it is that it has survived intact). Both versions of Bruegel’s "Tower of Babel" — startlingly different (the larger one, from Vienna, more satiric; the smaller one, from Rotterdam, much darker and more ominous) — are shown here together for the very first time. Bruegel's depictions of "Tower of Babel," with the version from Rotterdam on the left and Vienna on the right. But nowhere on view was "Landscape with the Fall of Icarus," which didn’t have all that far to travel to Vienna from its home in Brussels. I met with Elke Oberthaler, chief conservator of the Kunsthistorisches Museum and one of the Bruegel show’s four curators and co-authors of the magnificent catalogue, which is just about to appear in this country. I couldn’t resist asking her about this particularly well-known painting and why it was missing. And her answer was like a punch in the gut to someone who had grown up with Auden’s poem. “It’s not by Bruegel,” she told me. 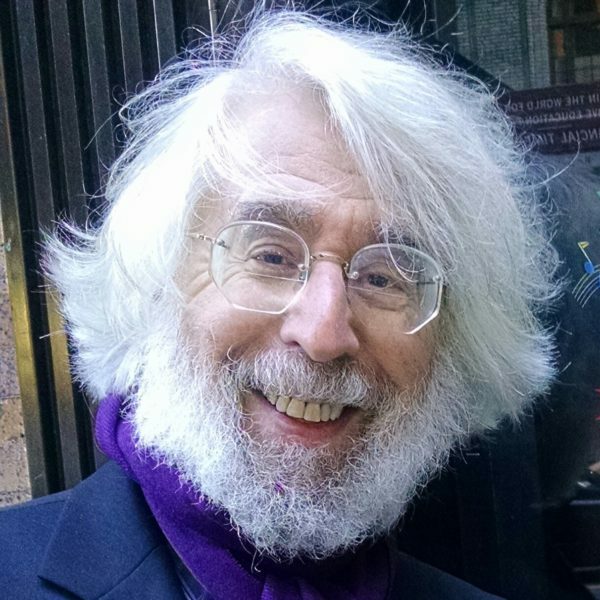 (An examination in the mid-'90s brought the original attribution into doubt.) 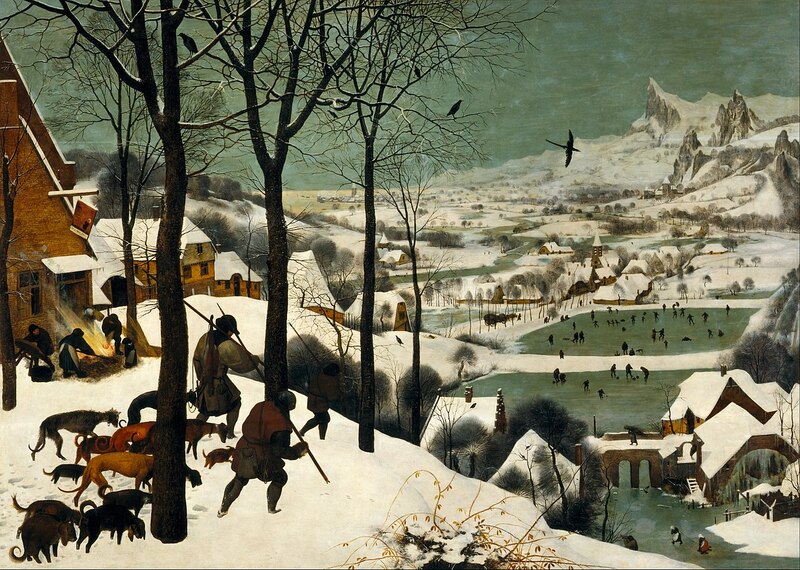 However, Oberthaler acknowledged that it was probably a copy of a lost Bruegel painting. But certainly not a Bruegel! Bruegel's "Hunters in the Snow." Conservators and curators know better than ever, through careful examination of brush strokes and pigments and X-rays, which paintings are the authentic masterpieces and which are imitations or copies. They can follow a painting, like a poem, from its “first draft” to its final, finished version, including painted-over areas from decades — or centuries — later. Oberthaler told me that, for example, one of the hunters trudging in "Hunters in the Snow" was a later addition by Bruegel, and that the crow looking away from the crucifixion scene in "Christ Carrying the Cross" was originally looking directly at the events — which in some way is further evidence that "The Fall of Icarus," in which bystanders ignore the central tragedy, must have been copied from an original Bruegel.